By HeatherLynn on March 12th, 2012 . 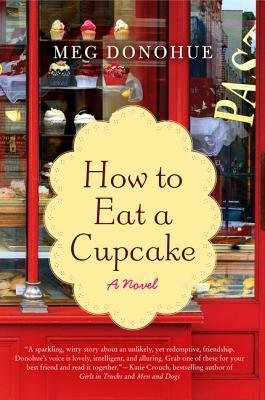 Filed under: Books, Cupcake Ideas, Free, Giveaways . I eat a cupcake with lots of love & sprinkles on top! I lick the frosting off first, then eat the cake! When eating a cupcake first to go is the wrapper. I like to pull apart the bottom portion of cake and take frosting from the top ensuring each bite has equal cake to frosting ratio.then eat the remaining top portion of the cupcake. Cupcakes are love in a wrapper! The first thing I do when eating a cupcake is to pull of the wrapper. After that I break the cake in to two even parts and stick the bottom part on the top, like a sandwich. Then I take a big bite. Yummmm. The first thing I do is take the wrapper off. Then I split the cupcake in half and eat the cupcake with a fork (I know I use a fork :/ ) then I take small fork fulls making sure there is frosting and cake in each bite. I take about 15 minutes to eat the cupcake making sure I enjoy each and every flavor in a bite. -Take of the wrapping and lick of the crumbs!! YOU PIG OUT AND EAT THE DELICIOUS MORSEL OF CAKE AND FROSTING!!!!!!! I eat a cupcake slowly. Teeth first, making sure to enjoy every bit of the sweet creamy frosting and the moist light cake bite by bite. I eat a cupcake by removing the wrapper and eating it with purpose enjoying every flavour and the texture making sure to not leave any frosting on the wrapper! I eat it like I eat a Swedish semla; a big bite across and with a looong tounge you lick your face clean. I twist off the top and then sandwich the two halves placing the frosting in the middle. First, I have to get just a little taste of the frosting with my tongue. Then after peeling the entire liner off, I fit as much of the cupcake and frosting in my mouth as I can. If that does not work as well as it should, I try my hardest to eat proportional amounts of the frosting and cake or I end up eating the frosting and the cake separately. I peel the wrapper back and just eat it one bite at a time. Some with frosting and cake as much as I can. First I lick all the frosting off, then I peel back the wrapper and eat the cake, with lots of sips of water in between. After the cake, I eat all the crumbs. I like to take a yummy cupcake and break it in half and then sandwich the frosting in the middle…so good!!! I like to dive into a cupcake! Okay, not literally. But I try to make my first bite really count by getting good portions of cake and frosting for the perfect, harmonious balance of flavors! I love to try and take a huge bite first that includes icing and cake. Then I will use a spoon on larger cupcakes to get an equal amount of cake and icing together. If there are toppings I tend to eat 75% of them first before every biting in. I cut the cupcake in half and eat one half and safe the other half for later I don’t feel so guilty and usually with coffee!! Yummy! I peel the liner off and try to get frosting and cake in every bite! I set a pretty small plate on the table with a fork and a napkin. The cupcake is set on the plate for me to admire for a moment before it is destroyed a small bit at a time. If there is a cherry on top, (it better have a stem!) I pick it up with two fingers and pop it into my mouth. Mmmm. No cherry? Time to unwrap! The paper comes off and is wadded into a little moist ball and tucked under the plate out of sight. Ahhhh… NOW the fun begins. With my fork I take small bites starting at the edges, making sure frosting is in every bite. If I find a filling (oh sweet surprise!) I PICK UP the cupcake and take bites until the filling is gone. Now… my fingers are already messy, so I finish off the cupcake in hand, licking my fingers and my lips to make sure I have ALL the good stuff. I wipe my face and fingers with the napkin. Nothing to drink? If the cupcake was moist as it should be (and mine are!) I didn’t need anything to drink!! I believe cupcakes have happily “eaten” me. When I eat a cupcake I peel off the wrapper take one nice bite then I take half of the bottom and put it on top of the icing like a cupcake sandwich and finish it off….if its a filled cup cake I eat it nice and slow it enjoy all the flavors, the cake the icing and the filling. I take one big bite then take a little nibble of the icing…then the filling…then the cake. First I like to take a lil taste of the frosting then I remove the wrapper slice it in half and enjoy it. Yummy!! I love eating & baking cupcakes. Of course I take off the wrapper and take bites where I get cake and frosting together. Trying not to get any on my face, and if I happen to oh well. if there’s a candied disc or topping, it gets eaten first! next, unwrap the cupcake, cut it into fourths, proceed to eat. Take a pic for scrapbooking. Take off wrapping. Use a fork and makes sure every bite has a biy of cake and frosting. Then enjoy happily!!! I put out a cold cup of smooth creamy milk, then I set out the delicious specimen of cake and frosting goodness. Then taste frosting. Then a taste of cake. Then together!!! *yum* I lick my lips…. Oui, Oui, Oui, Mecri!!!!!! I then use a spoon(weird ya?) and take small bite of the cupcake making sure each has a bit of both the frosting and cake. Oh golly. If I think its super duper good I will get another for my adorable 3 year old cousin. I like to eat my cupcakes slowly, using small bites to savor the taste. First: I take off the wrapper and tear the bottom of the cake off and eat it. No better way to eat a cupcake then breaking it in half horizontally, then turning the top part upside down and making what I call a “Cupcake burger.” Nom, nom nom. I tend to tear the top off and eat the bottom first, then enjoy the top with all the scrumptious icing, so it’s the last taste in my mouth! I eat half the cake and then eat the rest of the cake with the icing for a better ratio. Yum! I eat the bottom half, saving the cupcake top and icing for last! I close my eyes on every bites.. I like to take my time licking off the frosting first, then slowly pull the wrapper off and start eating from the top down. Get a plate & a fork-yes that’s right I do! Peel the paper off first.Then, if it’s a divine looking cupcake I dive right in with my fork and just keep going if it’s as good as it looks. If it’s just nice looking, I slowly taste it and speed is decided from there. If it’s just a basic cupcake to feel the need because that’s what’s available, I don’t bother with a plate & fork-just peel paper and eat. carefully remove paper liner – gently nibble sprinkles or other toppings – one big bite from bottom of cupcake to as high on the frosting as possible – eat remaining cupcake with a plastic (yes, plastic) fork and knife – the utensils help each slice have cupcake and frosting in every bite – lick all frosting from plastic fork, plate, fingers, etc. – look in mirror to see if my tounge is bright purple or green – grin! Hmmmm, I peel off the wrapper, tear it in half to share it with my son, then lick the frosting,(on my half of course) then enjoy every last little crumb! Peel off the wrapper and then I just take a big bite. I close my eyes and take a bite, making I get some icing.